In a blatant ploy to buy votes for his re-election, Gov. Scott Walker signed a law in April that will give parents of young children $100 per-child cash rebate just in time to make them feel good about him -- if they apply by July 2 to get the money later in the summer, along with a one-week tax holiday in August on school supplies. Sneaky Scott, loading up the pitiful goodies just before the November election. An estimated 600,000 Wisconsin families could see the largesse from these two tax programs, some $137 million in all that will not be better spent directly on schools but try to make Walker look like a child-friendly governor. It is such a raw attempt to buy favor and votes that many families are casting around to find a better use. An educator friend has the best idea of how to turn the tables on Walker. Families should take the $100 per child and give the money to their favorite local Democratic candidate to help turn the state’s education slump around and defeat Walker in the bargain. Change the legislature and the governor -- and educational needs will start to be met! It’s one of the few times that the cavalier way Walker has used state taxpayer money for his own image-stroking can be turned around and pointedly used to tell him to go away. It is rightly being called Walker’s Folly – giving citizens ammunition to vote his gang out of office with his own misuse of our money. There is, alas, no such simple turnaround with most of what the conservative elites are doing to cripple democratic norms. And that has turned out to be particularly true about their own tax bill. They’ve made it a living breathing example of why trickle down doesn’t work – especially when no controls are put on greed. The main problem was giving most of the money to the wealthy who already have it and doing very little for the struggling workers. All those words about how good businesses leaders would elevate Main Street along with Wall Street rather than line their own pockets are now exposed as a farce. The tax bill dropped the corporate tax rate from 31% to 25% but according to many news sources, the corporate preference was to use that windfall not for workers but for stock buybacks – $178 billion in the first three months of 2018 while hourly earnings for American workers averaged a 67 cent increase. Trump and the GOP had touted the tax bill as good news for the American worker, but again and again companies have decided not to invest in their home workforces or expand them, or even improve their facilities – all of which could be accomplished, and the public was told it would be, by lowering the corporate tax rate. Instead, the tax bill has mainly resulted in using profits to benefit shareholders and continue to outsource jobs. The picture postcard for this behavior is a Milwaukee landmark company – Harley Davidson. 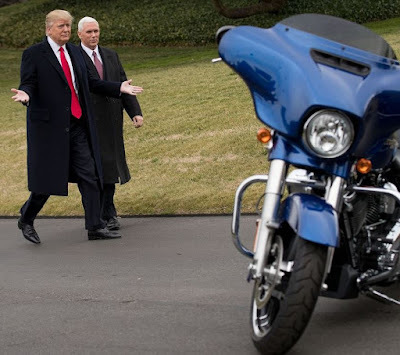 Whatever pride Wisconsin felt when its motorcycles were displayed on the White House lawn and Trump spake wonderful words about the company have now vanished. Harley has taken its tax profit to reward shareholders – announcing a dividend and a stock buyback of 15 million shares – and close its Kansas City plant, throwing 800 out of work while claiming it was adding 450 various jobs in York, Pennsylvania, a loss of 350 jobs if you are keeping count. The Steelworkers and machinists of Harley are keeping even better count, pointing to a new Harley facility about to open in Thailand as well as a plant in India to increase the company’s international fleet. There is also a plant in Brazil. In 2017 Harley and two unions representing production employees terminated their 22-year partnership, so Harley felt under no legal compulsion to tell the workers they were losing their jobs. 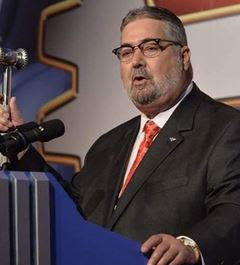 Machinist President Robert Martinez Jr. Asked to elaborate, Martinez said simply, “America’s working men and women deserve better than being thrown out onto the street.” He clearly wants to hold Trump’s feet to the fire of his campaign pledges. But Harley is hardly alone in seeing the tax bill as a way to line CEO pockets and shaft the worker, both blue collar and middle class. Other companies that have gone the stock buyback route rather than elevate its US workforce: Alphabet (Google’s parenting company), Cisco, Wells Fargo, Pepsi and many more. Walker’s Folly may give voters a chance to fling his cash back in his face to help opponents, but curing the corporate behavior over the tax bill requires careful strategizing about what sort of votes will right the ship. 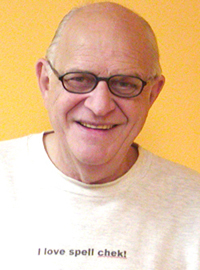 About the author: Noth has been a professional journalist since the 1960s, first as national, international and local news copy editor at The Milwaukee Journal, then as an editor for its original Green Sheet, also for almost two decades the paper’s film and drama critic. He became the newspaper’s senior feature editor. He was tapped by the publishers of the combining Milwaukee Journal Sentinel for special projects and as first online news producer before voluntarily departing in the mid-1990s to run online news seminars and write on public affairs and Internet and consumer news. From 2002 to 2013 he ran the Milwaukee Labor Press as editor. It served as the Midwest’s largest home-delivered labor newspaper, with archives at milwaukeelabor.org. In that role he won top awards yearly until the paper stopped publishing in 2013. His investigative pieces and extensive commentaries are now published by several news outlets as well as his culture and politics outlets known as Dom's Domain. He also reviews theater for Urban Milwaukee.